I have just got my first commercial commission - i am designing a range of 6 pieces of jewellery which are to be manufactured in hong-kong, and attatched to matching greetings cards! 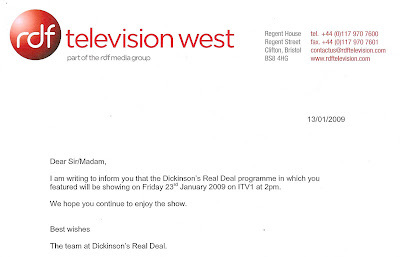 In may 2008 Dickinson's Real Deal came to Todmorden to do a filming session, so naturally i thought why not take some bits along? So i took a selection of vintage and antique jewellery, and some 'not-quite-scrap-more-chavvy-crap' gold jewellery, that i had collected at car-boots etc. for very little money, none of the old stuff was of any real value or interest, but the they said that they had a dealer who bought scrap gold, and so i went over to the table, and did the deal! Unfortunately the only piece of 'my' jewellery that we had with us at the time was a polymer clay fish necklace that my mum was wearing, so that was filmed to, and i said a bit about myself, what i make, and, to encourage me the dealer gave me that day's market value and i made about £60 profit! - so i got a really good deal! The program is on ITV 2pm on the 23rd of this month, if anyone happens to be around! let me know if you spot me! Those of you who follow this blog will find both of these pieces familiar. Toby has reworked them both for me. 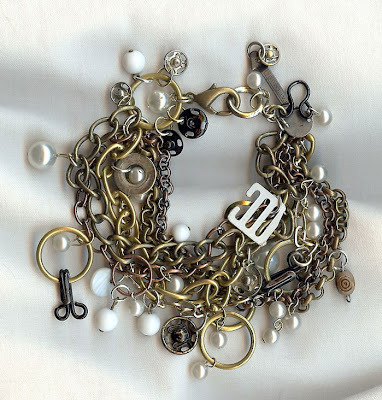 Firstly the multi chain bracelet, which he has enlarged, and also added more poppers, curtain rings and beads. 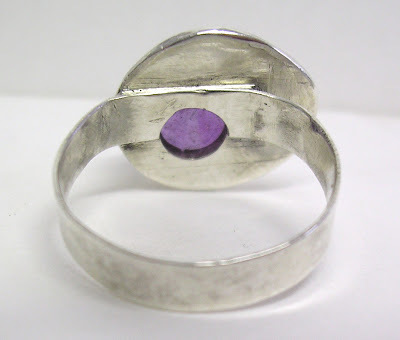 This piece is very much 'me', I love it's quirkyness! Secondly, 'Pacman 'n pearls'. The Pacman you have seen before, it is made from a silver 3d piece from 1920, the year my father was born, set on some hand rolled silver. My Dad gave the 3d to Toby, so it is extra special and personal to our family. 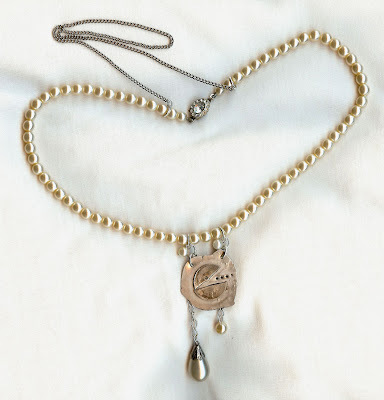 I asked Toby if I might have it, so he made it into a necklace for me, using a string of vintage pearls with a lovely little diamonte clasp, and adding special danglies and a safety chain too. I am so lucky to have an 'inhouse jeweller' !! 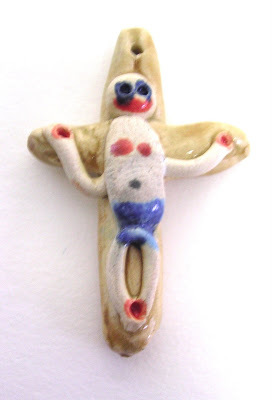 I made these ceramic jesuses (or would it be jesi as in octopi???) at my pottery class, which i go to with my Dad every other friday. Everyone there found them funny, and i just wanted to share them with you. They all have little holes at the top, so i can make jewellery with them, but i'm not sure what i should make - any suggestions? 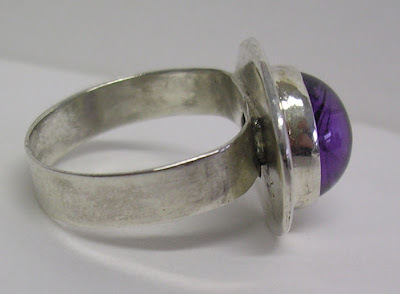 This is a 100% recycled amethyst ring which i made all by myself! ( i lie. 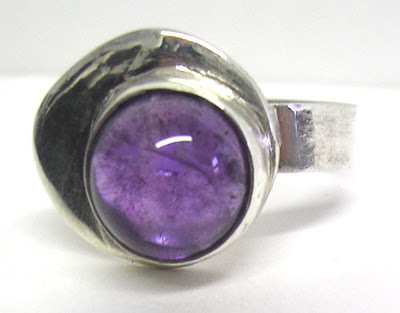 i hade help with the final polish, and the setting of the stone...) It is made of sterling silver, and is for sale if any one is interested. The side of the ring. The back of the ring.